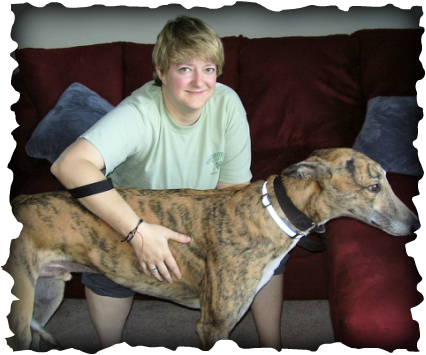 Kelly of Miamisburg fell in love with greyhounds in Florida several years ago but waited until she bought a house to add one to her family. The lucky boy who was a good match for her was brindle Kiowa Oak, now called Darrow. He was climbing her stairs within minutes, happily explored the yard, and eventually figured out that the big new dog bed in the living was just for him. He shows his approval by roaching regularly. We hope to see Kelly and Darrow at many of our GAGC events.